This is the second cinematic trailer for For Honor. It debuted at E3 in 2016 and focused on the story part of the game. It is also referred to as the story trailer. A discussion with MAXIME LUÈRE (Director and Co-founder at Unit Image), CÉLIA DIGARD (Producer), LAURENT HELMLINGER (Mocap Supervisor), and TONY DUGARD (CG Supervisor) of Unit Image. Bailey: Just to dive in here, I want to know more about what the initial process was like for getting this project. Was it something that they reached out to you for, or did you bid on the project? 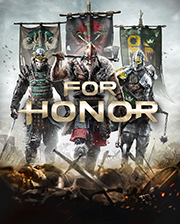 Maxime Luère (Director): Ubisoft came to us in August of 2015 and they wanted us to be in a competition between three studios. They created a trailer the previous year, and now they wanted a story trailer. Color key for an early shot. 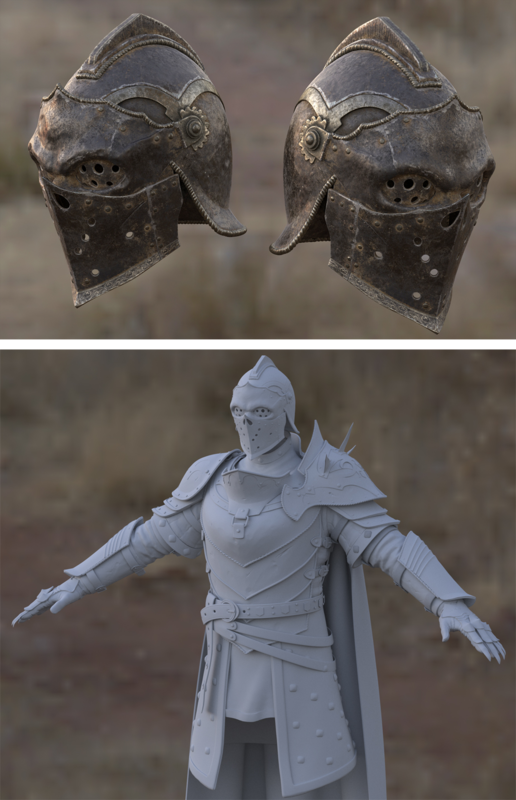 Apollyon mesh (work in progress). Bailey: When you were building what the opening destruction sequence was going to look like, how did you decide on the scenes that you wanted to show? For instance, the black substance that shoots out of the well. Maxime: In the game, the destruction is not just an earthquake. So, we wanted to put in some hints to make sure that people don't think it's just an earthquake. It's a way to say that it's an apocalypse, it's god spreading the destruction. 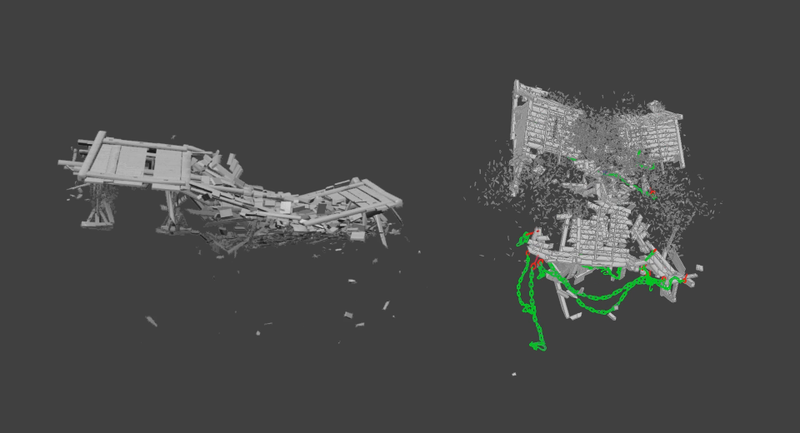 Layout for a shot during the destruction sequence. Célia Digard (Producer): And the idea was to show that there is no more available water. So, that's why there is this black water coming out of the well. It was important for the viewers to understand that there is no water anymore and that's why they are fighting in the next sequence. Bailey: I see, so that fight sequence built around that idea that there was no water. And that's something that came from the game. Maxime: Yes, but it's not in the game, it's in the background story. Bailey: To talk more about characters, what were some of your references for creating the three main characters that are fighting in the cinematic? Célia: We had the characters from the game, and we had to create news ones, but they were based on designs from the game. We took several designs and we adapted them to create new characters. So, it was always based on the game. Bailey: Did you have a group of concept artists that were working internally? Maxime: Not for characters because the game is close to the release. They have a lot of character design on everything. So, we just picked up what we wanted. The main thing is that the characters are not so realistic. They have different proportions with a little head and big muscles. So, Ubisoft had a clear vision of what they wanted, so we just had to match what they said. The concepts and designs we did were for the environments. Bailey: For the environments you had more concept artists working, like for the destruction scenes but also for the main environment (with the broken bridge) where most of the cinematic takes place. Maxime: Yes, the broken bridge. We used an interesting process because we set up a layout in 3D, and then we took that layout for a concept artist to paint all over it. And then this concept was given back to the 3D people who made a realistic version of the concept. Bailey: You did some back and forth with paint-overs, so they were influencing each other. Bailey: About how long does that process usually take when you're doing a shot like that? Célia: From the layout to the final image? Célia: Two to three months. Bailey: About how many people are usually working on something like that? Maxime: Not so many. Maybe two or three per shot. For the next sequence, in the whole environment, there are maybe thirty shots. Development comparison of the legion aftermath. Tony Dugard (CG Supervisor): For the aftermath shot, when there is no animation, where you saw the boats crashed on the land, we are talking about just those shots. Not the entire cinematic. On those shots we had maybe two months. Development comparison of the samurai aftermath. Célia: So, the idea is that for these three shots there was a special workflow. There was back and forth between layout, concept art, and then 3D. So, since they were single shots, they took like two to three months. However, there were not a lot of people on it because they had time. It was a single shot so they could really get deep into the creation of the shots. But what Maxime was saying was that for the whole sequence, for example the battle sequence, there were like thirty shots within the same environment. It took longer with many more people. Development comparison of the viking aftermath. Bailey: What about for the time-lapse sequence where the camera is spinning around them, moving further away, and revealing the whole battlefield? Célia: That was another case. That was a special workflow because it was a mix between two environments. There was a special team on this whose job was to go from one environment to the next. And from one group of characters to the next. There were many other things too like adding trees and changing the lighting. Bailey: It was definitely a very unique sequence. Can you talk a little bit more about the details of what challenges you faced when creating that time-lapse sequence? Maxime: For this shot, Laurent can talk about the motion capture because that was quite challenging with all of those characters in this scene. Laurent Helmlinger (Mocap Supervisor): Especially for the time-lapse shot, we first worked on the choreography we received from the motion capture. So, we were based on the timing of the choreography. We created a scene in our animation software, MotionBuilder. We began with the main characters' animation. Usually we work on layout in MotionBuilder so we can get our first camera timing and first layout of this shot out to our 3D people. So they can work on the timing of the different transformations of the time-lapse sequence. 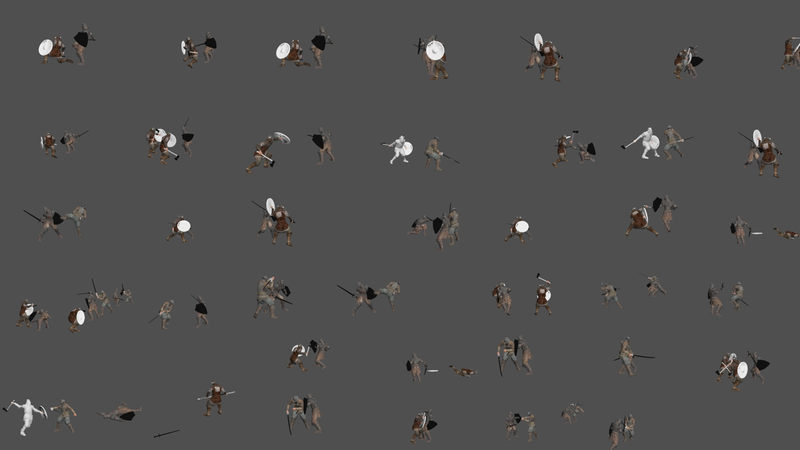 On the animation we split all the fight choreographies as different layers. We worked first on the heroes' fight. That gave us the base of the timing. And then we built a lot of loops of fights. We gave this to the 3D people so they could build the scene after that. Bailey: I was going to ask if all the people in the crowd were based on unique motion capture data. Laurent: Yeah, we shot different choreographies for each fight. For a group, we can use three or four actors. And for this time-lapse shot we had like twenty or thirty different group animations. Many of the fight choreographies for the shot. Bailey: That's pretty awesome. How large was your mocap team? Laurent: We mixed motion capture animation and layout, but we were like five people. We do the first integration of animation on our character. So, we work on rough mocap to do the layout. And then when the layout is done and we are all set up for the editing, we work more on the animation in the shots. We were four people doing this. Bailey: Do you have your own mocap studio, or do you do it somewhere else? Laurent: The mocap was done at Ubisoft Montreal. It was quite good working with those guys. They were so professional and there was a supervisor of the choreography who would say, "Good, that was just perfect the very first time." There were like three main actors, and there were like four or five minions—the little guys that are fighting during the time-lapse. I think there were like six or seven people for the stunt choreography. On the motion capture stage. Maxime: In the making of this, Ubisoft asked us to keep the experience of the gameplay. So, we contacted the stunt choreographer. That team knew the game. Célia: They had the weapons of the game too, which was very important. Bailey: To have it match as much as possible, at least in terms of what's possible in the game? Color key for when a new challenger lands. Layout for a shot during the meeting sequence. Bailey: Did you ever have to redo something because it wasn't in line with the game? Maxime: Of course every time you do a trailer, you have to be close to what the game is going to be because if you over promise in the trailer, there will be disappointment. So, we had to be very accurate along the whole process of creation. But I think it's a collaboration that went smoothly, and, again, the people in Ubisoft mocap are super proud. So, it was a smooth process. Bailey: What were some of the things that you learned during the process of making this trailer? Célia: We learned a lot about crowds, crowd simulation, and rendering. The time-lapse sequence was a challenge because it was a new technique to make our characters pop in and out. And making the trees grow was pretty tough. So, that's where we learned the most, I guess. And during the special effects sequence, at the beginning. Color key during the time-lapse sequence. Bailey: You mention the trees growing, what did you use to get that effect to work? Célia: We used software called SpeedTree which enabled us to make the trees grow and move. We could control the way they were growing and the speed of their growth. The timing had to be perfect, since the camera is spinning around. It's naturally about the way the characters are popping in, but it was also very important for the viewer to understand that the time is moving. So, the trees had to be popping at exactly the right moment for the viewer to see them, but not to be disturbed by them. Bailey: And you were also adjusting the daylight, the clouds, and the effects. Tony: We made two different environments. We started with the dry, rocky environment that had no trees or grass. We used a lot of scanned materials, like for the rocks and cliffs. After that we made a full, green environment with trees and grass. At that moment, we used static trees and static grass. Once we had the look and feel of final shot, we decided to make the trees grow in SpeedTree. And then we focused on the growing animations. It took a lot of previews to make this shot work well. Once we had that, we started on the lighting. We used an animated HDRI, but it wasn't very efficient. So, we decided to cut small pieces of the HDRI and then insert another image to make the time feel like it was going very fast. But it was like it was only one day. It wasn't very cool. So, we intercut the animated HDRI with many other HDRIs. We did this in After Effects and exported it to a 32-bit animation of the HDRI, and then put it into the scene. Célia: And what we noticed was that if you do a time-lapse, and you see the night in your lighting progression, you will feel that it's only one day and one night, or maybe a week that is passing by. But for us it was important to show that it was more like a thousand years. It went from dry to completely green with all the trees. And so we decided to remove the nights and make it so that you couldn't really notice the nighttime. This way we could feel that there were a lot of years passing by. Bailey: Is there a particular portion or element of this cinematic that you were most happy with? Maxime: Yes, the destruction sequence was quite challenging for us. We recruited a lot of people and we are very grateful for what they did as a team. That was so hard and so challenging because we had moving trees on the destruction, the lighting setup, and the houses. You can see very, very little, but when you make destruction like that, you have to create everything in the house. Like its structure and every tile on the roof. You cannot use textures to represent the geometry like you usually can, or put all the objects together in one mesh. You have to create every piece and every structure. So, that was quite a hard process. But when we saw the first render, it was quite satisfying. Everything had to break apart during the destruction sequence. Ambient occlusion render during the destruction sequence..
Bailey: You couldn't pass over any detail because it was all visible. Laurent: The challenge was to keep it realistic and for each department to push the envelope and be more realistic. Maxime: The game is very amazing. The graphics are so crazy, that we have to work as hard as we can. It's always good to have a little pressure like that because that's how we have so much energy to make our work. Bailey: Absolutely. I think you did an excellent job on it. Is there anything that you are most looking forward to for your company or for the industry as a whole? Maxime: Maybe you saw the movie Kingsglaive? I like the way that those studios like Blur, Digic Pictures, and Axis Animation have grouped to make a whole film. It's my vision of the future that the coordination of all these studios to make bigger things. It could be very great, and I'm very excited about that. Bailey: Yeah, I think that's very cool. I noticed that a lot of companies were working on it. Maxime: We try to work on different projects and I think for me it's really important we try to work on cartoon and realistic animation. So, different types of images. It's really exciting. Bailey: Thank you all so much for taking the time to speak today. It's been a great pleasure.